Found via Unclutterer which I found via the Happiness Project. The Lady Lindy from Bobarra is one of the most elegant bags I've seen in a long time: really simple lines, but with a touch of flair via the scalloped trim. Plus, it's checkpoint-friendly. Can't get better than that! I've been watching The Tudors series on CBC. Up here in Canada, the season just finished and I've been wondering how I might start working more brocade, puffy sleeves, jeweled head pieces and snoods into my wardrobe. 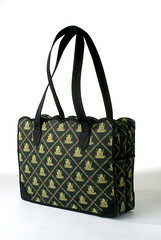 Luckily, I have found the perfect bag that Catherine of Aragon or perhaps her daughter, Mary would carry. Elegant and stylish without being over the top - a bag fit for a queen. I'm referring to the Lady Lindy laptop bag from Bobarra. Andrea from Bobarra was kind enough to send over one for review. When I first unpacked the Lady Lindy, I was struck by two things. One - the unusual fabric pattern. 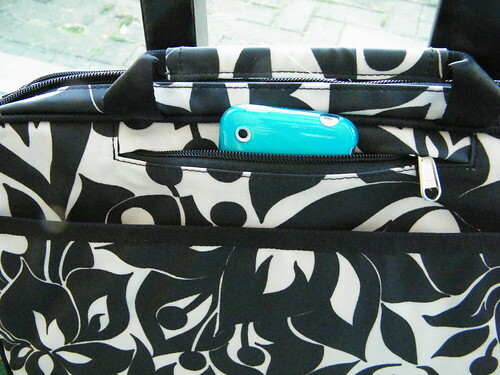 When carrying it, I've had a number of people say "Great pattern - what is that, fleur de lis?" Then they look closer. "It's frogs! Frogs!?". Yes, frogs. I have the "Charlotte" pattern (named after the delightful southern city in North Carolina; Bobarra also has several other more traditional fabric patterns if you're not a ranidaphile). From a distance, it looks like an elegant, slightly Tudoresque fabric - but up close, whimsical frogs. Very clever! 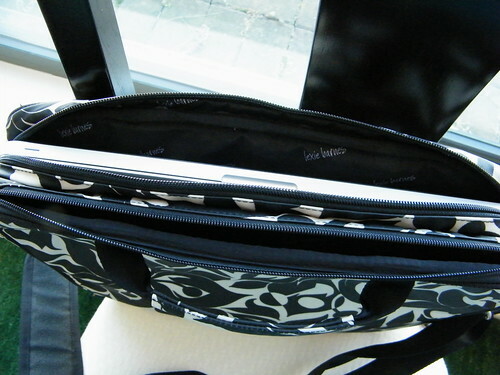 The second visual aspect of the bag that really stands out are the scalloped top edges. I've never seen this is a laptop bag before and to me, it really takes the finishing to a whole new level. Again, sophisticated with a touch of whimsy. Check out my full review of the Lady Lindy from Bobarra. The e-Pad Laptop Desk - Both a Laptop Bag and a Portable Desk! And I can't tell you HOW I know, but I do have it on good authority that both Katy Perry and Taylor Swift love their e-Pad. I have been spending WAY too much time on Etsy lately. Way. Too. Much. Time. I can't help myself though - people are so crafty and make such pretty things!